ELIZABLAZE | Discover Purpose. Live on Purpose. Live Creatively: Is my life in my work or my work in my life? Is my life in my work or my work in my life? I recently attended an empowerment conference for women, and in one of the workshops (the one I joined), work-life balanced was discussed. I was initially in another group, but when I saw work-life balance as the topic for the second group I switched. I switched because I was curious, especially because I had written on the topic before, therefore I wanted to hear or learn from the perspective of the speaker. And of course, it confirmed my fears. The group coordinator started with the wonderful question: Is my life in my work or my work in my life? Well, it was established that our work is in our life. As much as I see the answer as right, yet I have an issue with the perspective from which it was been communicated. In the first place, why do we preach work-life balance? I'll say mostly to prevent our work (job, career and business) from conflicting with the other aspects of our life, especially because we spend much of our time at our work place. Due to my keen interest in helping people live their life to the fullest, I constantly do personal research on topics such as work-life, psychology of behavior, retirement, life purpose, etc. I have come to conclude that we can sensitize people on the need for a balanced work-life, but more emphasis should be placed on work-life synergy. 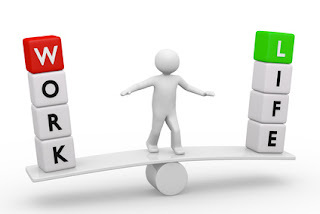 Work-life balance and work-life synergy are two different concept. I personally will love to help organization create and implement a work-life balance plan for their employees, then teach and guide employees into developing a work-life synergy. This is because work-life balance is more action based, while work-life synergy that come as a result of a developed sense of purpose is more mental based. People with a conflicted work-life are prone to diseases such as schizophrenia and depression. And these are the kinds of mental disorders I hear that makes me feel I need to do something to help out. I can keep on writing on this topic and not get bored, but I will take it step by step in future posts so that we can help ourselves and help others around us. But to conclude today's post, remember that work-life balance and work-life synergy can only be achieved in an atmosphere of love and a sense of purpose.